Piston seals be suitable for using in auto-transmission. is the elastomer of sealing element. There are many choices you could select for different environment conditions and the functions. The general elastomer include nit rile (NBR), polyacrylate (ACM, PA), silicone (MVQ), fluoroelastomer (FKM, FPM). Polyurethane, natural rubber, EPDM and HNBR. 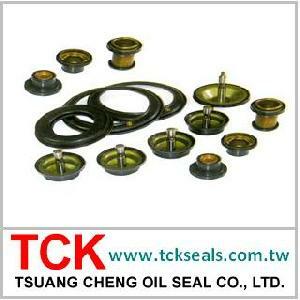 Company Name: Tsuang Cheng Oil Seal Co., Ltd.